The Hillary Step was the final obstacle on a climb to the summit of Everest. We’re at a similar moment in U.S. healthcare. When the Hillary Step simply fell off Everest, it caught my attention. At the time, I had recently sold my first company and was pondering my next move. Having spent 20 years in U.S. healthcare, my thoughts inevitably shifted to some of the momentous challenges we face there and a realization soon emerged — the U.S. healthcare industry has reached a Hillary Step moment of its own. So how on earth could the Hillary Step be related to U.S. healthcare? Well, I believe the industry has actually been on an Everest-sized ascent — from a world where doctors record patient health records on paper and then store them in color-coded files across every location a patient has ever received care to a world where patients and providers have easy, secure access to a patient’s complete health record in digital form. With health data liberated in this way, patients and families can be more engaged in their health, providers can more effectively coordinate their care, researchers and policy professional are better equipped to guide public and population health efforts, and, ultimately, overall patient care and outcomes can drastically improve. In short, I see the moment when we achieve a truly, decentralized, accessible, and secure patient health record as the healthcare industry’s equivalent of summiting Everest. So how far have we come on the climb? The ascent began in earnest in 2009 with the federal government funding $36 billion of subsidies to incentivize healthcare practices to adopt the “meaningful use” of electronic health record (EHR) systems. With this infusion, approximately 87% of providers have moved onto these these platforms and are now digitizing the recording of patient records and billable healthcare events. As “meaningful use” of EHR’s has risen, the U.S. Center for Medicare and Medicaid Services (CMS) has introduced multiple carrot and stick models to provide metrics to support “Value Based Care” in order to more closely tie healthcare reimbursements to patient outcomes. With these policy changes, we are seeing providers beginning to steer towards treating the patient as a consumer of healthcare, while Medicare is successfully transitioning from a “passive payer” to an “active purchaser” of value based care. However, thinking about this, both back in 2015 and even now, in 2018, it is hard to see how these developments have changed things for the better for patients or providers. When I consider my family and other people like us who are just looking to receive quality care when we encounter health issues, I continue to be disappointed by the system, or lack thereof. Redundant paperwork, incoherent bills, and disjointed care are all effects of a system that remains siloed and confusing. Doctors are not faring any better in this system — a recent Stanford Medical survey found that physicians now spend 19 minutes in their EMR for every 12 minutes of direct patient interaction. We have come so far, and, although the goal we’re aiming for is within reach, we seem stuck. It’s as if we’ve made it 28,839 feet up the 29,029 feet of Everest, are near the top, but we’re all gathered at the foot of a metaphorical Hillary Step, wondering if we actually will make it up after all of this effort. For a climber, one of the largest problems the Hillary Step presented was not the technical challenge of getting up and over the rock face, but, rather, the long line of climbers at the foot of the Step, waiting their turn to climb up. 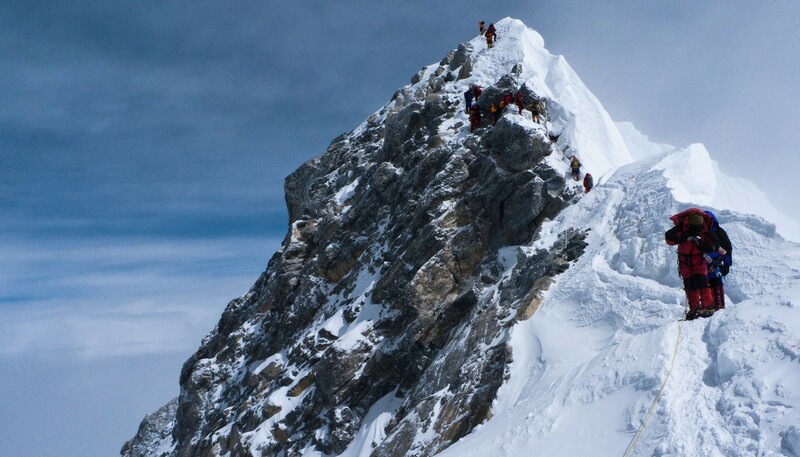 This “bottleneck” at the base of the Hillary Step is infamous in Everest climbing lore and has proven to be disastrous, even fatal, when there is lack of communication and coordination between competing climbing teams. I believe we’re at a similar bottleneck in the quest for the liberated patient record. Patient health records, although now largely digitized, are siloed between dozens of different EHR providers who have little incentive to communicate with each other. The US government continues to develop rules and regulations to incentivize cooperation but often these rules create more work for healthcare providers. Healthcare systems are consolidating and attempting to standardize their technical architecture but are having difficulty finding a single EHR solution that solves for their complex array of use cases, while hundreds of digital health start-ups are hitting the market but it’s hard to know whether many of them are reducing or increasing complexity. Many have looked at this bottleneck and commented that we need a Silicon Valley outsider to come in and be the “disruptor,” to shake the metaphorical Hillary Step off the mountain like that 2015 earthquake. However, the Silicon Valley mantra of “move fast and break things” does not play well in healthcare because when you break things, real human lives are on the line. We’ve recently seen a number of examples of “disruptors” — Theranos, Outcome Health, and NantHealth to name a few — where this mentality seems to have completely backfired. Many years ago, I learned the fundamentals of mountaineering by participating in an outdoor leadership program known as NOLS. One of the basic principles this program imparts to young mountaineers is to “Work with the mountain, not against it.” In my view, it is this mentality that will be the most effective in overcoming the health records bottleneck. By working with the complex array of stakeholders within the healthcare industry and not against them, I believe we can leverage the mountain of work that has already been completed and scale the final pitch on the way to realizing a liberated patient health record. So what does this look final push look like? We need the various players in healthcare to work together — from EHR vendors, to patients and providers, to the U.S. government, to 3rd party technology companies — to support an open, decentralized cloud of patient data that is easily accessible yet secure. We are already seeing this take shape with the emergence of a standardized API (FHIR) for exchanging health records, and I’m encouraged to see EHR companies beginning to support this standard in order to allow 3rd parties to develop solutions on top of their platforms. No one company will be able to solve for the dizzyingly vast array of end use cases for patient data, so EHR’s that make interoperability a priority will become the leading choice for healthcare organizations. Apple is also getting into the mix by supporting FHIR in order to allow patients to pull their health records from major health systems into the Apple Health iOS app and, in a huge win for patients, is now allowing 3rd party apps to extract records via the Health Records API. There is still greater alignment and coordination needed but these are moves in the right direction. Which brings me to why I started my latest company, Health Here. I strongly believe that patients and providers can benefit from a solution that builds on, as opposed to disrupts, all the positive work that the industry has already done. Therefore, I have decided to actively coordinate with existing players in the market to deliver a solution that would streamline patient data sharing, provide patients transparency on their financial responsibility for clinic visits, make payments easy, and eliminate redundant manual processes that are a headache for both patient and providers. We are doing this by integrating deeply with a clinic’s existing electronic medical record (EMR) and practice management (PM) systems, tapping into a number of existing open API’s to fetch and update medications, insurance benefits, and payment information, and, soon, will be leveraging the Apple Health Records API to make a patient’s registration for a visit with a new clinic potentially as simple as a few taps on their iPhone. Instead of revolutionizing the industry from the ground-up, we are proud to be building a platform that connects it. Ultimately, I believe that our solution will be one of many that help deliver on the promises of a decentralized, accessible, secure cloud of patient health data. Therefore, instead of waiting for an existential event on the scale of the earthquake that shook the Hillary Step off Everest, all of us in the healthcare industry should roll-up our sleeves, start working together, and make the final push up as a team. By removing friction from patient onboarding, payments, and logistics, Health Here enables healthcare providers to deliver more personalized care and empowers patients to take control of their health — building trust and enhancing the patient experience in the process. Learn more on our website or by watching this video.